should fulfil all these conditions. 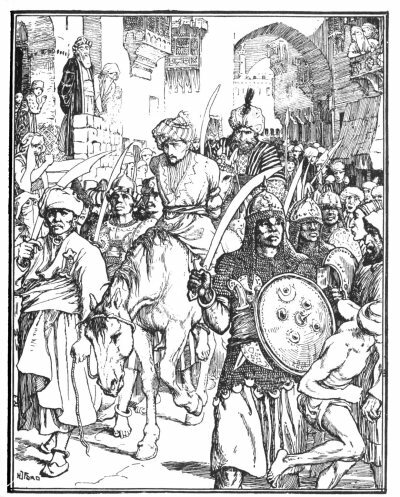 Saouy, who had been of the opposite side, and was jealous of the honour done to Khacan, said, "Sire, it will be very difficult to find a slave as accomplished as your Majesty desires, and, if she is to be found, she will be cheap if she cost less than 10,000 gold pieces." she sings, she dances, she makes verses, in fact there is no accomplishment in which she does not excel." than the dealer, wishing to bring the matter to a conclusion, sent for the merchant, and said to him, "It is not for myself that I wish to buy your slave, but for the king. Her price, however, is too high." 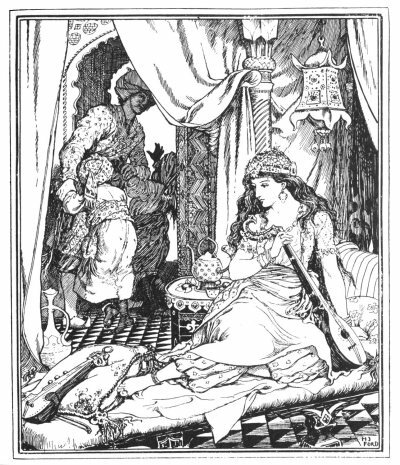 as he saw the beautiful Persian, though aware that she was destined for the king, he let himself be carried away by her charms, and determined at once to use every means in his power to retain her for himself. 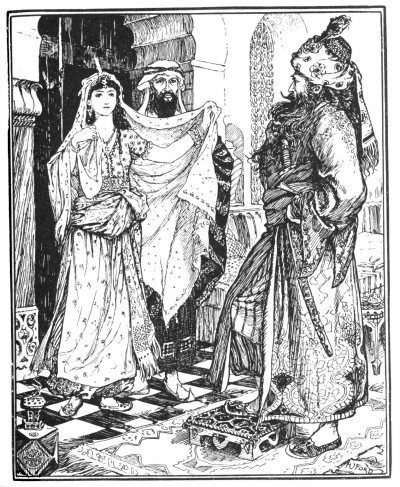 The Persian was equally captivated by Noureddin, and said to herself: "The vizir does me too great honour in buying me for the king. I should esteem myself very happy if he would give me to his son." "Wretched son! 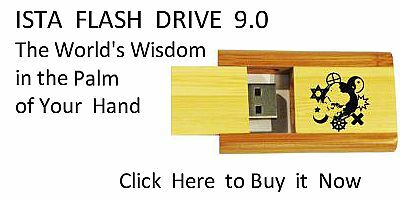 thou destroyest not only thyself but thy father. The king will shed not only thy blood but mine." [paragraph continues] I will obtain 10,000 gold pieces, and with this sum you will buy another slave." but I cannot pardon Noureddin before I have mortified him as he deserves." little society of ten young men all about his own age, with whom he spent all his time in continual feasting and merry-making. also at end, having been transferred by you to others. If you wish me to remain in your service, furnish me with the necessary funds, else I must withdraw." On learning that it was so, he promised to obtain the highest possible price for her. Leaving the beautiful Persian shut up in the room alone, he went ont to seek the slave merchants, announcing to them that he had found the pearl among slaves, and asking them to come and put a value upon her. As soon as they saw her they agreed that less than 4,000 gold pieces could not be asked. 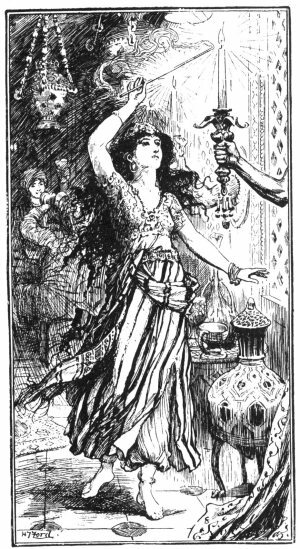 Hagi Hassan, then closing the door upon her, began to offer her for sale--calling out: "Who will bid 4,000 gold pieces for the Persian slave?" bought her he was capable of not paying the money. "What you must do," he said, "is to pretend that you had no real intention of selling your slave, and only swore you would in a fit of anger against her. When I present her to Saouy as if with your consent you must step in, and with blows begin to lead her away." you than what extra money you might obtain from the merchants." "Bad old man," he exclaimed, "rather than sell my slave to you I would give her to a Jew." "But, Noureddin," I remonstrated, "you do not consider that in speaking thus you wrong the king, to whom your father owed everything." This remonstrance only irritated him the more. Throwing himself on me like a madman, he tore me from my horse, beat me to his heart's content, and left me in the state your Majesty sees." reached Bagdad. When the vessel had come to an anchor they paid five gold pieces for their passage and went ashore. Never having been in Bagdad before, they did not know where to seek a lodging. Wandering along the banks of the Tigris, they skirted a garden enclosed by a high wall. The gate was shut, but in front of it was an open vestibule with a sofa on either side. "Here," said Noureddin, "let us pass the night," and reclining on the sofas they soon fell asleep. return of Scheih Ibrahim they begged him to open it, and to allow them to enter and admire the magnificence within. Consenting, he brought not only the key, but a light, and immediately unlocked the door. Noureddin and the Persian entering, were dazzled with the magnificence they beheld. The paintings and furniture were of astonishing beauty, and between each window was a silver arm holding a candle. keep them company. 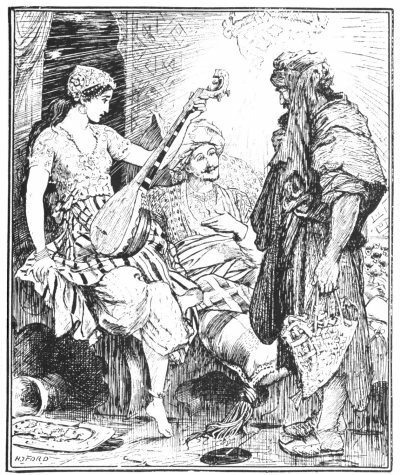 At first the old man declined, but was persuaded to enter the room, to sit down on the edge of the sofa nearest the door, and at last to draw closer and to seat himself by the beautiful Persian, who urged him so persistently to drink her health that at length he yielded, and took the cup she offered. his mosque, and asked permission to hold it in the pavilion. I granted his request, but forgot since to mention it to your Majesty." "Giafar," replied the Caliph, "you have committed three faults-- first, in giving the permission; second, in not mentioning it to me; and third, in not investigating the matter more closely. For punishment I condemn you to spend the rest of the night with me in company of these worthy people. While I dress myself as a citizen, go and disguise yourself, and then come with me." "In the name of the Most Merciful God. put it on his shoulders, and seat him in thy place without fail. Farewell." beautiful Persian, inconsolable at his departure, sank on a sofa bathed in tears. The old man, furious at this insolence as he considered it, took a cup and threw it at the Caliph, who easily avoided a missile from the hand of a drunken man. It hit against the wall, and broke into a thousand pieces. Scheih Ibrahim, still more enraged, then went ont to fetch a stick. The Caliph at that moment clapped his hands, and the vizir and the four slaves entering took off the fisherman's dress and put on him that which they had brought. that I have sent Noureddin to Balsora to be king, and as soon as all necessary preparations are made I will send you there to be queen. Meanwhile I will give you an apartment in my palace, where you will be treated with all honour." 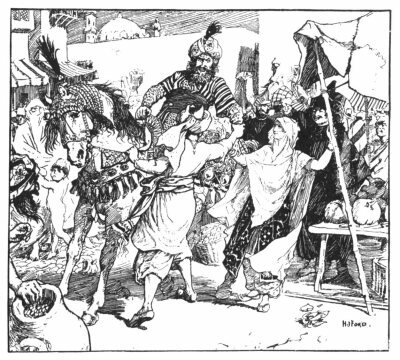 [paragraph continues] Saouy; if he were still alive, to bring him at once to Bagdad along with the king and Saouy.